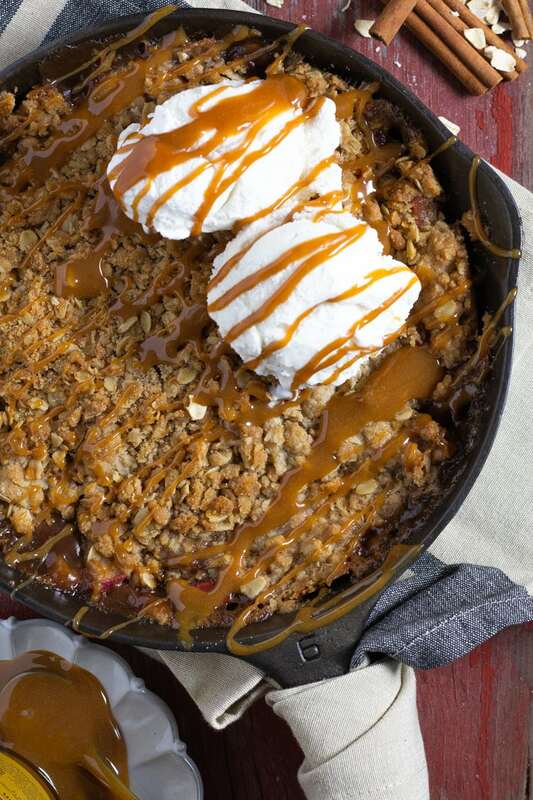 Homemade apple crisp is one of our family’s all time favorite recipes! 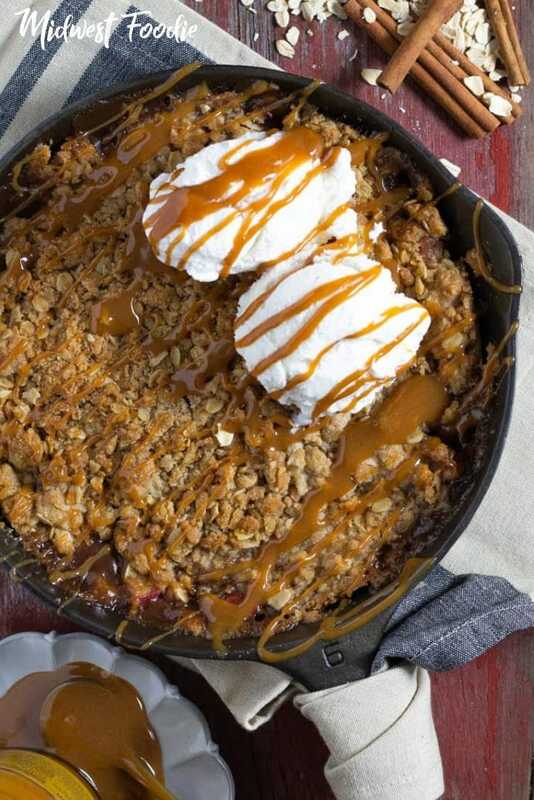 The tasty base of sliced honeycrisp apples combined with brown sugar and spices is topped with the most delicious crumbly crisp ever – flour, rolled oats, brown sugar, cinnamon and butter – then baked to perfection! 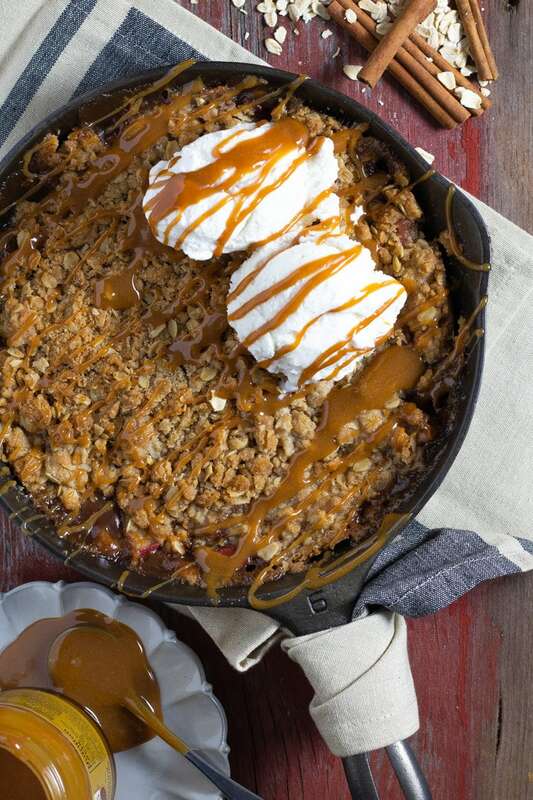 Drizzle with caramel sauce, top with vanilla ice cream and dig right in! What kind of apples should I use to make apple crisp? My favorite are honeycrisp but granny smith are great too! Basically you’re looking for an apple with a crisp texture that will stand up to the process of baking in the oven. You don’t want to end up with applesauce underneath that delicious crisp crust, so make sure you use a firm, fresh apple! Bon Appetit has a great post that explains in detail how to choose the right apple for baking. No! You can certainly can but you really don’t need to! I like the added texture of the skin and prefer to save time and hassle and leave the skin on. I also like the little peek of red that shows through the crumble topping. Of course not! 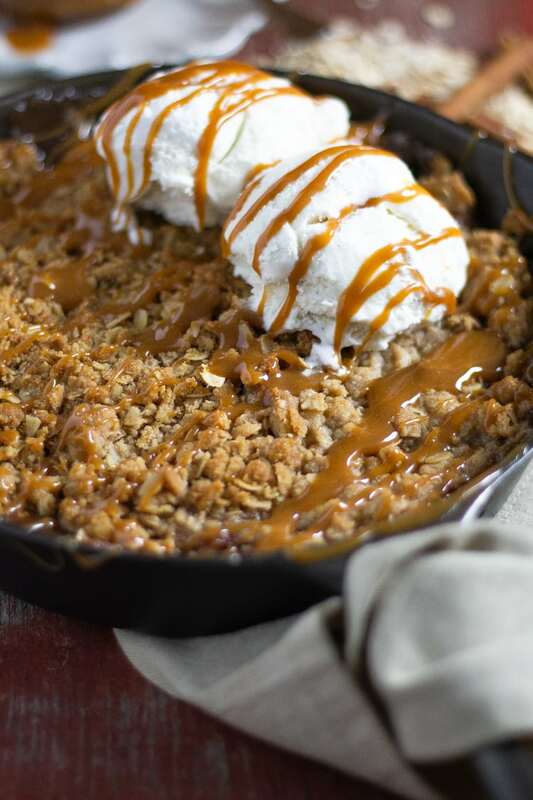 You’ll notice that these photos show the apple crisp in a 6 inch cast iron skillet but the recipe calls for a 9×13 pan. I divided my crisp between two baking dishes (cause you know I gotta have one for blog pics and one for digging into immediately!) but you can just use a regular ol’ 9×13 inch baking dish (or two 8×8 inch baking dishes instead). If you have a nice cast iron pan though, go for it! You all know how much I love to use my cast iron whenever I can!! I like the classic combo of butterscotch caramel and vanilla ice cream. However my mother in law serves apple crisp with a splash of heavy cream poured over it and it’s amazing! Whipped cream would be great too. Either way something cold and creamy really compliments the warm, cinnamon flavored apples and the crunch of the crisp topping. What kind of texture should my apple crisp have? One of the hardest things with baking can be deciding when something is done. 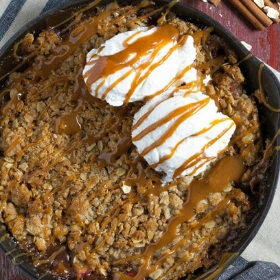 For this apple crisp you are looking for the apples to be fork tender, but NOT mushy and the crumble on top to be a golden brown but not burned. Everyone’s oven bakes differently so just keep an eye on your apple crisp and use your best judgement! 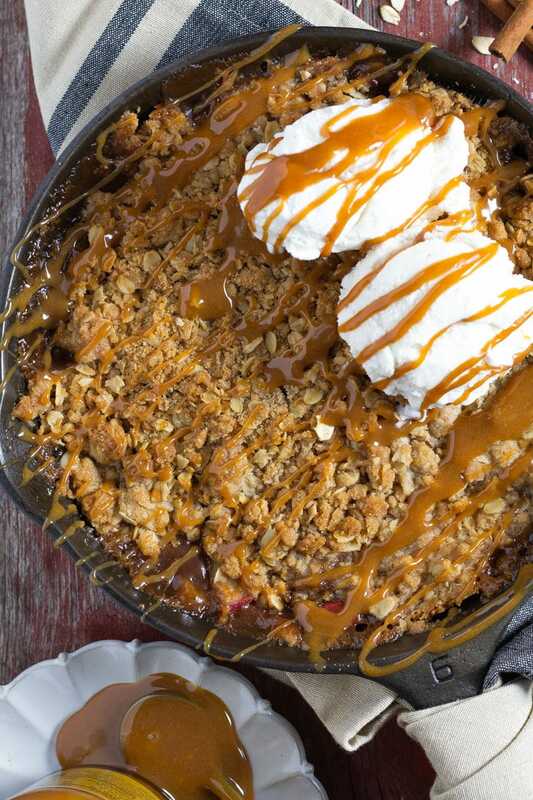 Homemade apple crisp is one of our family’s all time favorite recipes! The tasty base of sliced honeycrisp apples combined with lemon, brown sugar and spices is topped with the most delicious crumbly crisp ever – flour, rolled oats, brown sugar, cinnamon and butter – then baked to perfection! Drizzle with caramel sauce and top with vanilla ice cream and dig right in! Heat oven to 375 degrees and lightly grease a 9×13 baking dish. Add sliced apples to a large bowl and squeeze lemon juice over them. Then add remaining filling ingredients to the bowl and use your hands to toss the apples and evenly coat them in the spice mixture. Dump apples into the greased baking dish. In a medium bowl, combine crisp ingredients. Use your hands, a fork or a pastry cutter to combine ingredients and gently break butter up into pea size pieces. Spread topping in an even layer across the apples. Bake for 30 minutes or until the apples are fork tender and the crisp is a dark golden brown.